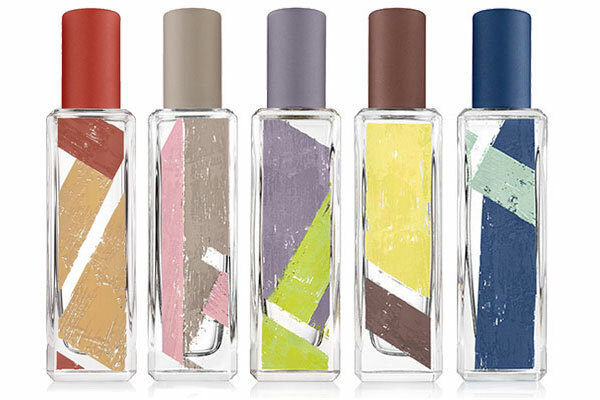 The Bloomsbury Set by Jo Malone - An aromatic fragrance collection for women and men. The Bloomsbury Set of luxury fragrances are inspired by Vanessa Bell's Charleston House in Sussex, and the free spirited artists and philosophers that made up the Bloomsbury Group: Virginia Woolf, E.M. Forster, Lytton Strachey, and John Maynard Keynes. Created by perfumer Yann Vasnier the collection of colognes include Blue Hyacinth inspired by the garden, Garden Lilies for the pond, Leather & Artemesia for the library, Tobacco & Mandarin for dinner, and Whiskey & Cedarwood for the nights at Charleston House. Launched in March 2017, and available in cologne sprays at Saks Fifth Avenue, Neiman Marcus, and Nordstrom. Intoxicating bold blue hyacinth warmed by the sun entwined with the vibrancy of garden geraniums and woody vetiver. The striking green facets of anise-tinged absinthe blend with aromatic artemesia, soft orriswood and the deep richness of leather enhanced by the amber woody notes of Cypriol. Vibrant mandarin and herbaceous sage sweetened with the warm elegance of beeswax and sweet pipe tobacco. Striking with a spicy peppery edge, pimento opens the fragrance with carnal warmth, while an irresistibly complex oriental accord with an enigmatic blend of sweet woody notes recreates the dignified impression of a fine whisky. Cedarwood, with its woody, dry character, imbues the base with charismatic intensity. Inspired by the free-spirited artists of the legendary Bloomsbury group - writers, philosophers and intellectuals, most notable among them Virginia Woolf - this collection of scents captures the intoxicating essence of an unconventional life in their legendary country house in the Bloomsbury area. The lily pond at dawn, bold blue hyacinth, absinthe afternoons and golden linseed on paint-stained hands. Warming whisky and sweet pipe tobacco. The secrets of waxed floors burnished by footsteps in the night. Each bottle in the collection is hand painted. FIRST IMPRESSION: "It smells of leather, and there's this amber - and earth and musk." FRAGRANCE NOTES: An anise-tinged blend of herbal artemesia, soft orriswood, and leather. WINE EQUIVALENT: "Red Bordeaux are known for leather and earth. There's a region in Bordeaux called Graves - which gets its name from the gravel in the subsoil - and this perfume has that same kind of stony quality." SOMMELIER VERDICT: "This was my personaly favorite. I would totally wear it, but I can't at work because then everyone would be smelling my perfume and not their wine."